Pizza of just about any kind is good in my book. I crave doughy, cheesy pizza probably at least once a week. And usually, we indulge. 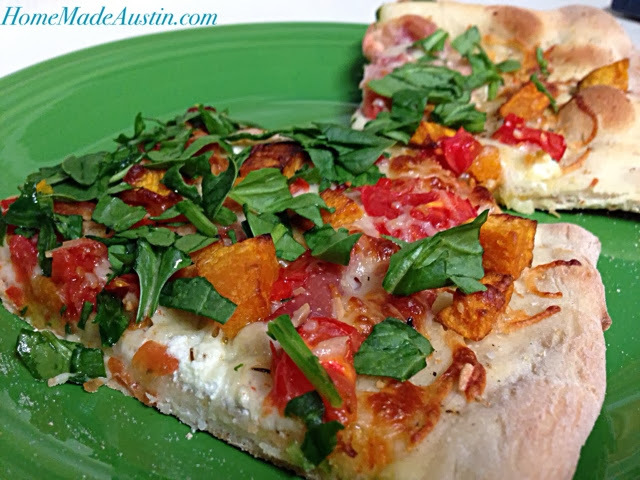 We were in the habit of ordering delivery pizza, but in an effort to cook more (& spend less!) 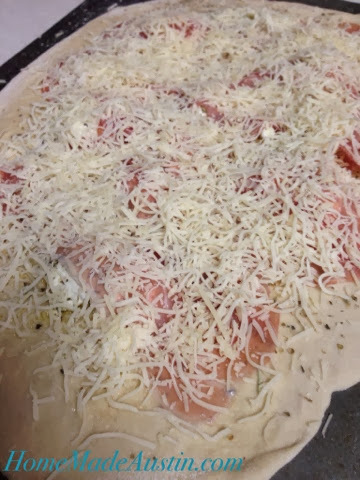 we've been making our own pizzas & I have to say, they've been awesome. The first time my now-husband Andrew cooked for me, he made pizza. He also made it the next three or four times he cooked for me, which I love to tease him about. Making pizza dough is still one of his regular jobs in our household & he always uses the recipe found in The Joy of Cooking. Before we moved in together, it was the only cookbook he owned. And if you're only going to have one, The Joy of Cooking is a good book to have. It is a great 'catch-all' with recipes for a ton of staple meals, as well as how to make variations on those classics. To do this day, when Andrew doesn't know how to make something...it's to the pages of that cookbook he goes. 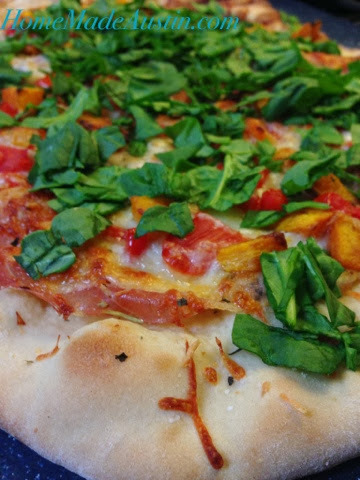 So, the basis of all of our homemade pizzas is The Joy of Cooking pizza dough. Last night, I decided to play with some new-to-us toppings. 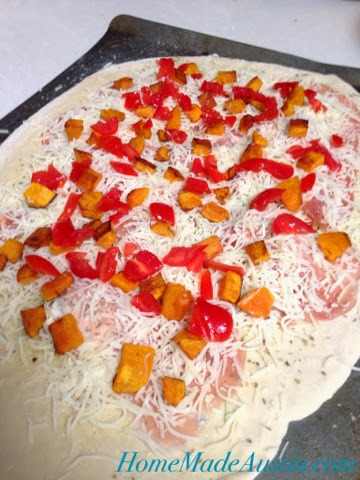 Inspired by the Naan Pizzas with Butternut Squash, Prosciutto and Fontina from Three Many Cooks, I decided to play around with the idea of butternut squash and prosciutto. I love that even though prosciutto is sliced super thin, it packs a meaty punch & while butternut squash is fairly new to me, every time I try it, I really enjoy it. Not to mention, it's fallen below 100 degrees here in Austin, so Fall is officially upon us! And that means using winter squash or pumpkin in everything, right? After Andrew's dough had risen on top of a warm oven for an hour or so, we got to work. 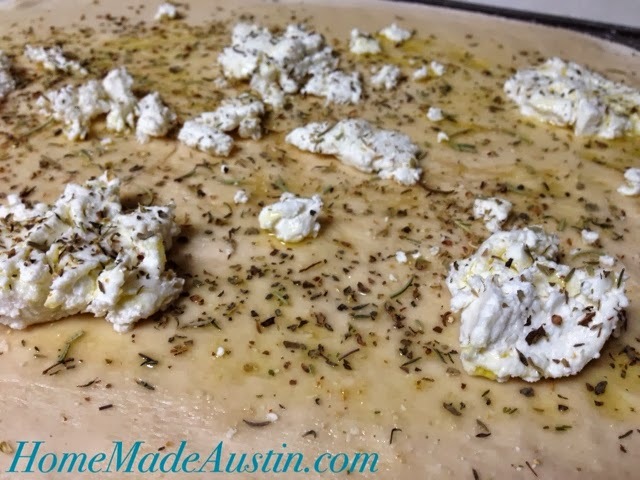 We started by doling out a few big spoonfuls of goat cheese on the pizza (next time I would spread it over the whole thing---it was that much of a winner) & sprinkled on some dried thyme, rosemary, basil, oregano & fresh cracked pepper, along with a generous drizzle of extra virgin olive oil. Then, we layered on about half a package of prosciutto. We covered the whole dang thing. Next layer: cheese! We used about half of a bag of pre-shredded Italian Cheeses mix. And I added on some extra shredded Parmesan for good measure. Because the only thing better than cheese, is more cheese. We then added on about half of a medium-sized butternut squash that I had cubed & sauteed with a little olive oil for about 6-7 minutes in a skillet over medium-high heat. Andrew also had the brilliant idea of adding on some quartered cherry tomatoes. This added a wonderful brightness to the pizza. Definitely add the tomatoes! The pizza cooked at 450 degrees for about 8 minutes on a pizza stone. You want the cheese to be oozey & bubbling & the crust to be golden. After removing the pizza from the oven, we topped it with some chopped fresh spinach. Arugula would be delicious as well. Everything came together beautifully, and probably quicker than we could have ordered it. We then proceeded to gorge ourselves on our newly invented pie while watching the season premiere of Two Broke Girls. 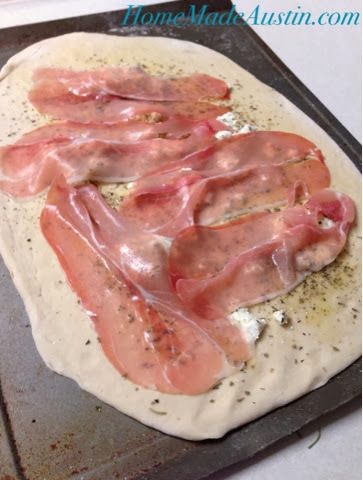 The crust was perfectly crisp & the goat cheese added creaminess while the prosciutto added a savory, salty bite. The sweetness of the butternut squash paired well with the bright tomatoes & the fresh spinach. All in all, a quick & easy, but oh so tasty pizza night at home.